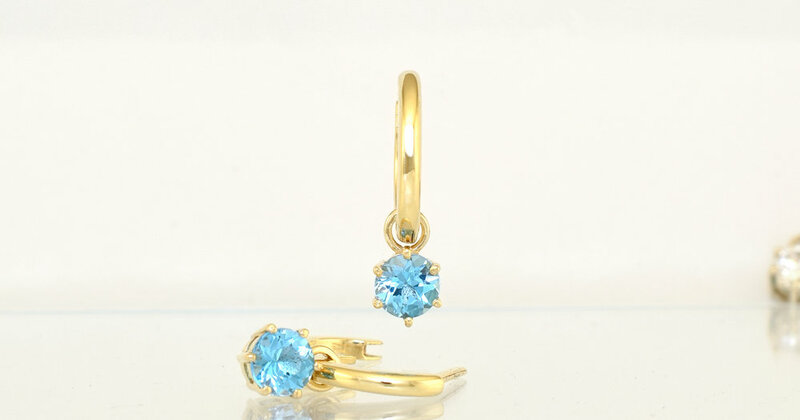 $330 Hoop and Pod pair in 9ct yellow gold set with any of the gemstones listed below. $85 Pod pair only (no hoop) in 9ct yellow gold set with any of the gemstones displayed. Cubic Zirconia, Amethyst, Citrine, Peridot and Rhodolite Garnet also available. $85 Drop pair only (no hoop) in 9ct yellow gold set with any of the gemstones listed above. All in stock. $330 Hoop and Drop pair in 9ct yellow gold set with any of the gemstones listed above. All in stock. The earrings as shown above are in stock. They can be made as studs as well as stud or shepherd hook drops in the precious metal & gemstone of your choice. Please email me for a quote and delivery time.